Water vapor trends is a big subject and so this article is not a comprehensive review – there are a few hundred papers on this subject. However, as most people outside of climate scientists have exposure to blogs where only a few papers have been highlighted, perhaps it will help to provide some additional perspective. Think of it as an article that opens up some aspects of the subject. And I recommend reading a few of the papers in the References section below. Most are linked to a free copy of the paper. Mostly what we will look at in this article is “total precipitable water vapor” (TPW) also known as “column integrated water vapor (IWV)”. What is this exactly? If we took a 1 m² area at the surface of the earth and then condensed the water vapor all the way up through the atmosphere, what height would it fill in a 1 m² tub? The average depth (in this tub) from all around the world would be about 2.5 cm. Near the equator the amount would be 5cm and near the poles it would be 0.5 cm. Averaged globally, about half of this is between sea level and 850 mbar (around 1.5 km above sea level), and only about 5% is above 500 mbar (around 5-6 km above sea level). How do we find IVW (integrated water vapor)? Frequent radiosonde launches were started after the Second World War – prior to that knowledge of water vapor profiles through the atmosphere is very limited. Satellite studies of water vapor did not start until the late 1970’s. Unfortunately for climate studies, radiosondes were designed for weather forecasting and so long term trends were not a factor in the overall system design. Radiosondes were mostly launched over land and are predominantly from the northern hemisphere. Given that water vapor response to climate is believed to be mostly from the ocean (the source of water vapor), not having significant measurements over the ocean until satellites in the late 1970’s is a major problem. As most people might suspect from the name, a reanalysis isn’t a data source. We will take a look at them a little later. Three names that come up a lot in papers on radiosonde measurements are Gaffen, Elliott and Ross. Usually pairing up they have provided a some excellent work on radiosonde data and on measurement issues with radiosondes. All the above trend studies considered the homogeneity of the time series in the selection of stations and the choice of data period. Homogeneity of a record can be affected by changes in instrumentation or observing practice. For example, since relative humidity typically decreases with height through the atmosphere, a fast responding humidity sensor would report a lower relative humidity than one with a greater lag in response. Thus, the change to faster-response humidity sensors at many stations over the last 20 years could produce an apparent, though artificial, drying over time.. 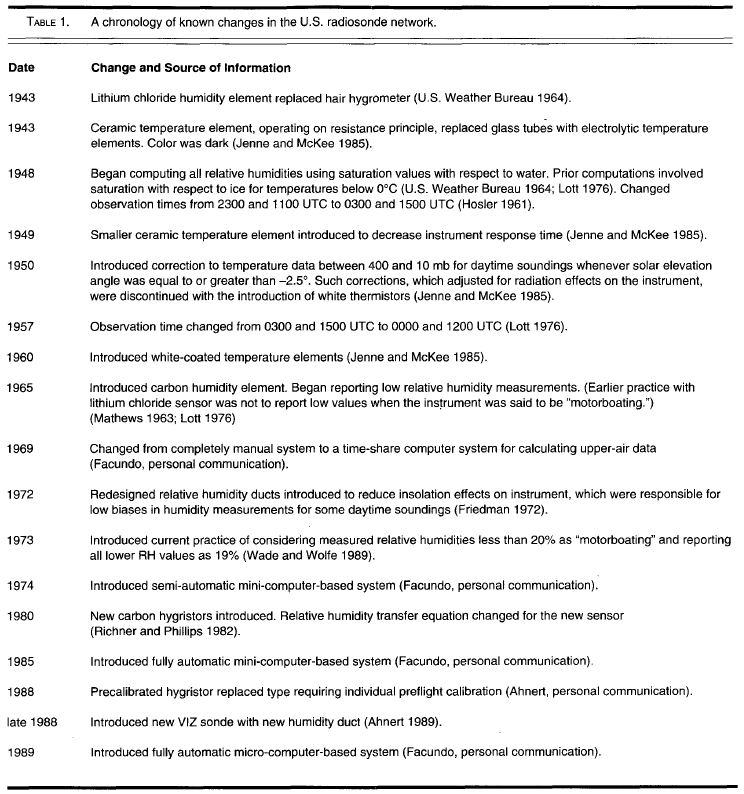 These examples show that the combination of historical and statistical information can identify some known instrument changes. However, we caution that the separation of artificial (e.g., instrument changes) and natural variability is inevitably somewhat subjective. For instance, the same instrument change at one station may not show as large an effect at another location or time of day.. Furthermore, the ability of the statistical method to detect abrupt changes depends on the variability of the record, so that the same effect of an instrument change could be obscured in a very noisy record. In this case, the same change detected at one station may not be detected at another station containing more variability. 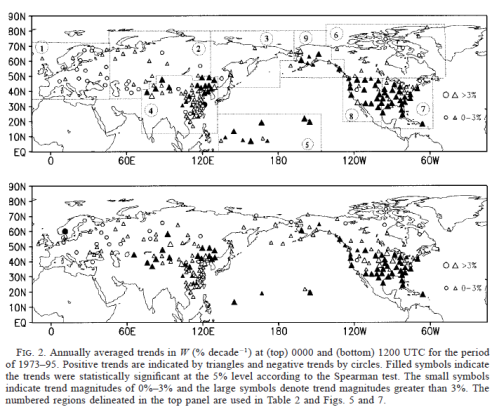 We found that a global estimate could not be made because reliable records from the Southern Hemisphere were too sparse; thus we confined our analysis to the Northern Hemisphere. Even there, the analysis was limited by continual changes in instrumentation, albeit improvements, so we were left with relatively few records of total precipitable water over the era of radiosonde observations that were usable. Well, I recommend that readers take the time to read the whole paper for themselves to understand the quality of work that has been done – and learn more about the issues with the available data. What is Special about 1973? In their 1991 paper, Elliot and Gaffen showed that pre-1973 radiosonde measurements came with much more problems than post-1973. Note that the above is just for the US radiosonde network. Our findings suggest caution is appropriate when using the humidity archives or interpreting existing water vapor climatologies so that changes in climate not be confounded by non-climate changes. The introduction of the new hygristor in 1980 necessitated a new algorithm.. However, the new algorithm also eliminated the possibility of reports of humidities greater than 100% but ensured that humidities of 100% cannot be reported in cold temperatures. The overall effect of these changes is difficult to ascertain. The new algorithm should have led to higher reported humidities compared to the older algorithm, but the elimination of reports of very high values at cold temperatures would act in the opposite sense. As the worst cases came before 1973, most researchers subsequently reporting on water vapor trends have tended to stick to post-1973 (or report on that separately and add caveats to pre-1973 trends). But it is important to understand that issues with radiosonde measurements are not confined to pre-1973. Most (but not all) of these changes represent improvements in sensors or other practices and so are to be welcomed. Nevertheless they make it difficult to separate climate changes from changes in the measurement programs.. Since then, there have been several generations of sensors and now sensors have much faster response times. Whatever the improvements for weather forecasting, they do leave the climatologist with problems. Because relative humidity generally decreases with height slower sensors would indicate a higher humidity at a given height than today’s versions (Elliott et al., 1994). This effect would be particularly noticeable at low temperatures where the differences in lag are greatest. A study by Soden and Lanzante (submitted) finds a moist bias in upper troposphere radiosondes using slower responding humidity sensors relative to more rapid sensors, which supports this conjecture. Such improvements would lead the unwary to conclude that some part of the atmosphere had dried over the years. Different countries tend to use different radiosondes, have different algorithms and have different reporting practices in place. The following comparison is of upper tropospheric water vapor. As an aside this has a focus because water vapor in the upper atmosphere disproportionately affects top of atmosphere radiation – and therefore the radiation balance of the climate. Since the same satellite is used in the comparison at all radiosonde locations, the satellite measurements serve as a fixed but not absolute reference. Thus we can infer that radiosonde values over the former Soviet Union tend to be systematically moister than the satellite measurements, that are in turn systematically moister than radiosonde values over western Europe. However, it is not obvious from these data which of the three sets of measurements is correct in an absolute sense. That is, all three measurements could be in error with respect to the actual atmosphere.. ..However, such a satellite [calibration] error would introduce a systematic bias at all locations and would not be regionally dependent like the bias shown in fig. 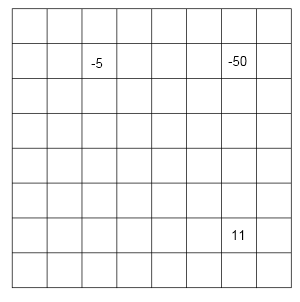 3 [=figure 6]. They go on to identify the radiosonde sensor used in different locations as the likely culprit. Yet, as various scientists comment in their papers, countries take on a new radiosonde in piecemeal form, sometimes having a “competitive supply” situation where 70% is from one vendor and 30% from another vendor. Other times radiosonde sensors are changed across a region over a period of a few years. Inter-comparisons are done, but inadequately. Over data-sparse regions such as the tropics, the limited spatial coverage can introduce systematic errors of 10-20% in terms of the relative humidity. This problem is particularly severe in the eastern tropical Pacific, which is largely void of any radiosonde stations yet is especially critical for monitoring interannual variability (e.g. ENSO). Thus there is some observational evidence for increases in moisture content in the troposphere and perhaps in the stratosphere over the last 2 decades. Because of limitations of the data sources and the relatively short record length, further observations and careful treatment of existing data will be needed to confirm a global increase. – and the relevant equations can be solved for each boundary or each element. It’s a numerical solution to a problem that can’t be solved analytically. Weather forecasting and climate are as tough as they come. Anyway, the atmosphere is divided up into a grid and in each grid we need a value for temperature, pressure, humidity and many other variables. To calculate what the weather will be like over the next week a value needs to be placed into each and every grid. And just one value. 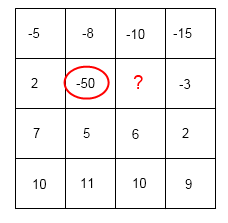 If there is no value in the grid the program can’t run and there’s nowhere to put two values. This is a simple example where the values represent temperatures in °C as we go up through the atmosphere. The first problem is that there is a missing value. It’s not so difficult to see that some formula can be created which will give a realistic value for this missing value. Perhaps the average of all the values surrounding it? Perhaps a similar calculation which includes values further away, but with less weighting. With some more meteorological knowledge we might develop a more sophisticated algorithm based on the expected physics. The second problem is that we have an anomaly. Clearly the -50°C is not correct. So there needs to be an algorithm which “fixes” it. Exactly what fix to use presents the problem. If data becomes sparser then the problems get starker. How do we fill in and correct these values? It’s not at all impossible. It is done with a model. Perhaps we know surface temperature and the typical temperature profile (“lapse rate”) through the atmosphere. So the model fills in the blanks with “typical climatology” or “basic physics”. But it is invented data. Not real data. Even real data is subject to being changed by the model.. There are a number of reanalysis projects. One is the NCEP/NCAR project (NCEP = National Centers for Environmental Prediction, NCAR = National Center for Atmospheric Research). The basic idea of the reanalysis project is to use a frozen state-of-the-art analysis/forecast system and perform data assimilation using past data, from 1957 to the present (reanalysis). The NCEP/NCAR 40-year reanalysis project should be a research quality dataset suitable for many uses, including weather and short-term climate research. An important question that has repeatedly arisen is how to handle the inevitable changes in the observing system, especially the availability of new satellite data, which will undoubtedly have an impact on the perceived climate of the reanalysis. Basically the choices are a) to select a subset of the observations that remains stable throughout the 40-year period of the reanalysis, or b) to use all the available data at a given time. Choice a) would lead to an reanalysis with the most stable climate, and choice b) to an analysis that is as accurate as possible throughout the 40 years. With the guidance of the advisory panel, we have chosen b), that is, to make use of the most data available at any given time. What are the categories of output data? Humidity is in category B. Interested people can read Kalnay’s paper. Reanalysis products are very handy and widely used. Those with experience usually know what they are playing around with. Newcomers need to pay attention to the warning labels. A bias changing in time can thus introduce a fictitious trend without being eliminated by the data assimilation system. A fictitious trend can be generated by the introduction of new types of observations such as from satellites and by instrumental and processing changes in general. Fictitious trends could also result from increases in observational coverage since this will affect systematic model errors. Assume, for example, that the assimilating model has a cold bias in the upper troposphere which is a common error in many general circulation models (GCM). As the number of observations increases the weight of the model in the analysis is reduced and the bias will correspondingly become smaller. This will then result in an artificial warming trend. 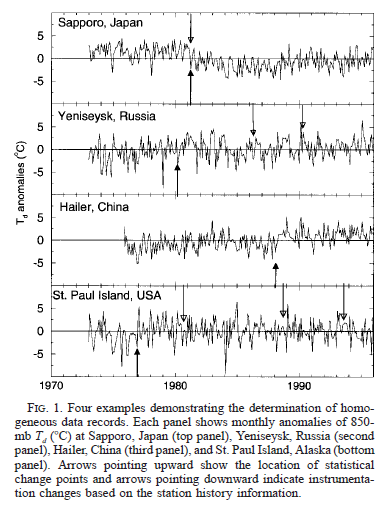 Bengtsson and his colleagues analyze tropospheric temperature, IWV and kinetic energy. ERA-40 does have a positive trend in water vapor, something we will return to. The trend from ERA-40 for 1958-2001 is +0.41 mm/decade, and for 1979-2001 = +0.36 mm/decade. 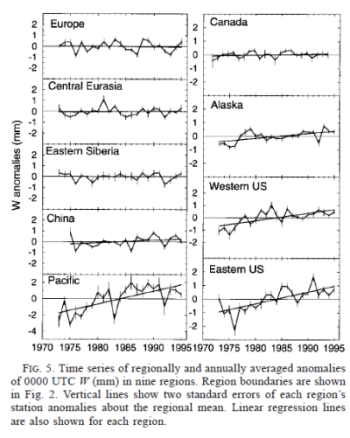 They note that NCEP/NCAR has a negative trend of -0.24 mm/decade from 1958-2001 and -0.06mm/decade for 1979-2001, but it isn’t a focus of their study. They do an analysis which excludes satellite data and find a lower (but still positive) trend for IWV. They also question the magnitudes of tropospheric temperature trends and kinetic energy on similar grounds. The point is essentially that the new data has created a bias in the reanalysis. Returning finally to the question in the title of this study an affirmative answer cannot be given, as the indications are that in its present form the ERA40 analyses are not suitable for long-term climate trend calculations. However, it is believed that there are ways forward as indicated in this study which in the longer term are likely to be successful. The study also stresses the difficulties in detecting long term trends in the atmosphere and major efforts along the lines indicated here are urgently needed. 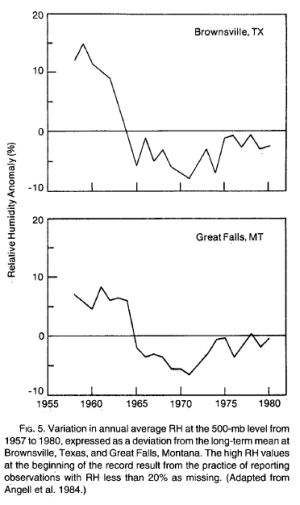 So, onto Trends and variability in column-integrated atmospheric water vapor by Trenberth, Fasullo & Smith (2005). This paper is well worth reading in full. For years before 1996, the Ross and Elliott radiosonde dataset is used for validation of European Centre for Medium-range Weather Forecasts (ECMWF) reanalyses ERA-40. 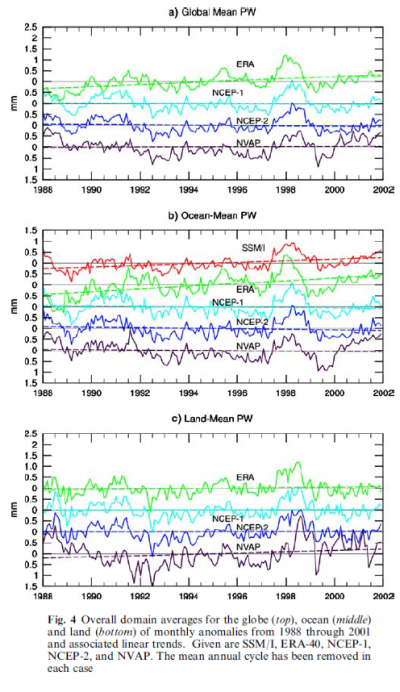 Only the special sensor microwave imager (SSM/I) dataset from remote sensing systems (RSS) has credible means, variability and trends for the oceans, but it is available only for the post-1988 period. 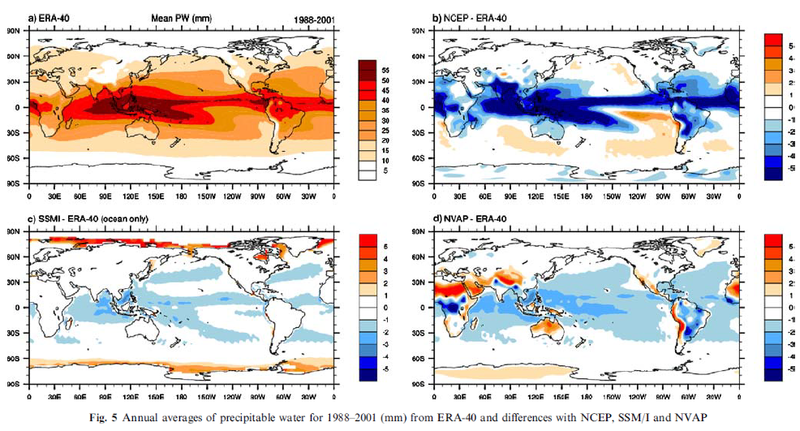 Major problems are found in the means, variability and trends from 1988 to 2001 for both reanalyses from National Centers for Environmental Prediction (NCEP) and the ERA-40 reanalysis over the oceans, and for the NASA water vapor project (NVAP) dataset more generally. NCEP and ERA-40 values are reasonable over land where constrained by radiosondes. Accordingly, users of these data should take great care in accepting results as real. Then they consider 1988-2001, the reason being that 1988 was when the SSMI (special sensor microwave imager) data over the oceans became available (more on the satellite data later). At this point we can see that ERA-40 agrees quite well with SSMI (over the oceans, the only place where SSMI operates), but NCEP/NCAR and another reanalysis product, NVAR, produce flat trends. Now we will take a look at a very interesting paper: The Mass of the Atmosphere: A Constraint on Global Analyses, Trenberth & Smith (2005). Most readers will probably not be aware of this comparison and so it is of “extra” interest. The total mass of the atmosphere is in fact a fundamental quantity for all atmospheric sciences. It varies in time because of changing constituents, the most notable of which is water vapor. 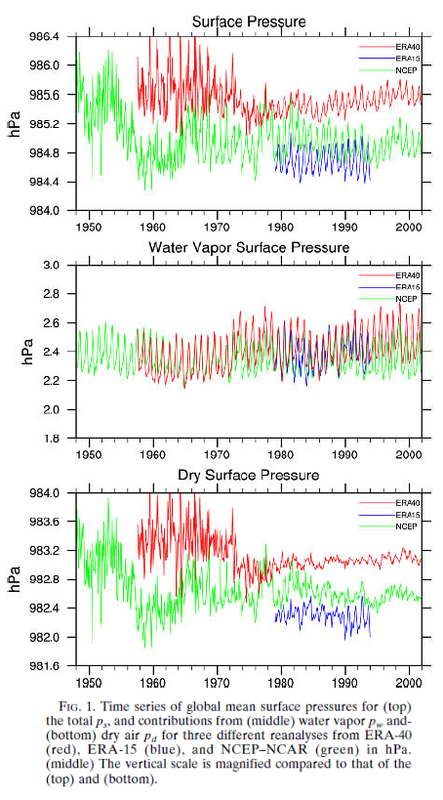 The total mass is directly related to surface pressure while water vapor mixing ratio is measured independently. Accordingly, there are two sources of information on the mean annual cycle of the total mass and the associated water vapor mass. One is from measurements of surface pressure over the globe; the other is from the measurements of water vapor in the atmosphere. The main idea is that other atmospheric mass changes have a “noise level” effect on total mass, whereas water vapor has a significant effect. As measurement of surface pressure is a fundamental meteorological value, measured around the world continuously (or, at least, continually), we can calculate the total mass of the atmosphere with high accuracy. 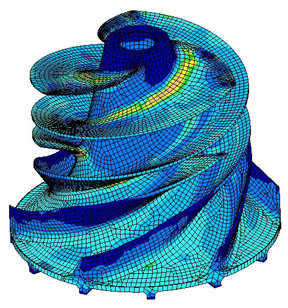 We can also – from measurements of IWV – calculate the total mass of water vapor “independently”. Subtracting water vapor mass from total atmospheric measured mass should give us a constant – the “dry atmospheric pressure”. That’s the idea. So if we use the surface pressure and the water vapor values from various reanalysis products we might find out some interesting bits of data.. In the top graph we see the annual cycle clearly revealed. The bottom graph is the one that should be constant for each reanalysis. This has water vapor mass removed via the values of water vapor in that reanalysis. Pre-1973 values show up as being erratic in both NCEP and ERA-40. NCEP values show much more variability post-1979, but neither is perfect. The focus of the paper is the mass of the atmosphere, but is still recommended reading. The NCEP trends are more negative than others in most places, although the patterns appear related. Closer examination reveals that the main discrepancies are over the oceans. 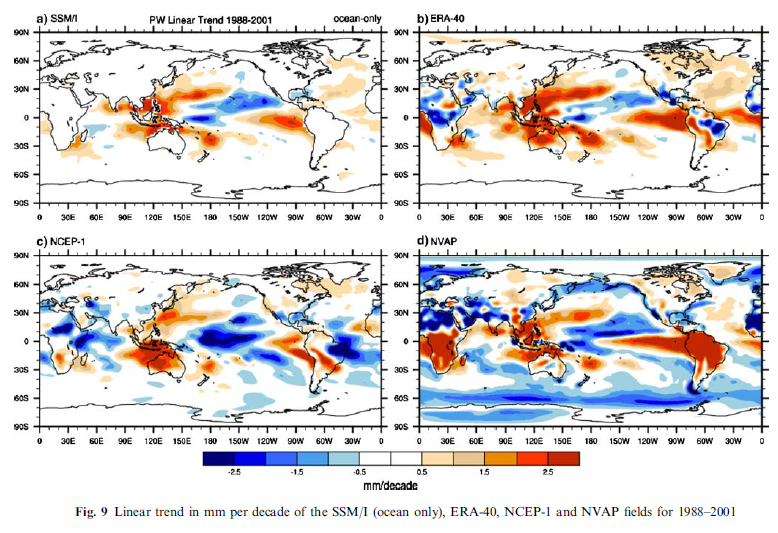 There is quite good agreement between ERA-40 and NCEP over most land areas except Africa, i.e. in areas where values are controlled by radiosondes. SSMI has a trend of +0.37 mm/decade. 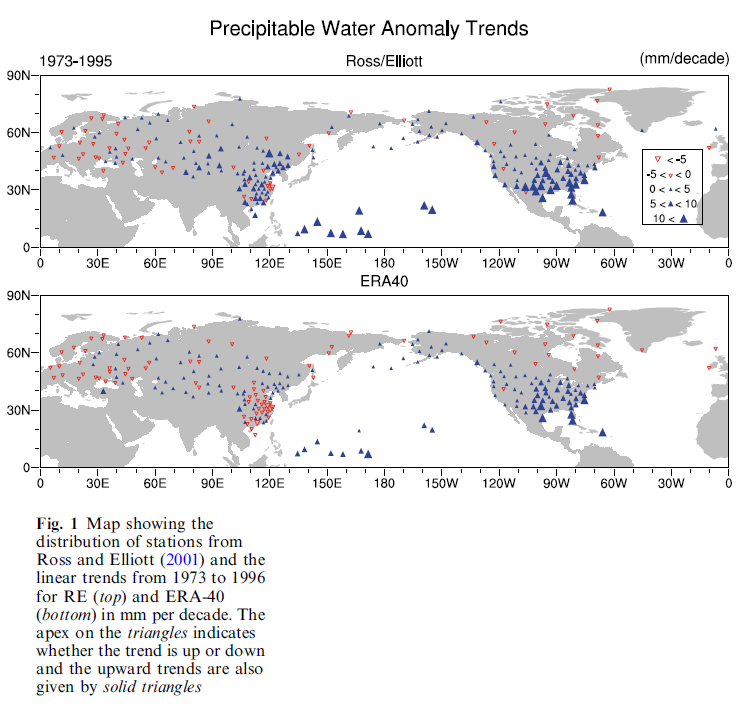 ERA-40 has a trend of +0.70mm/decade over the oceans. NCEP has a trend of -0.1mm/decade over the oceans. As this article is already pretty long, it will be continued in Part Two, which will include Paltridge et al (2009), Dessler & Davis (2010) and some satellite measurements and papers. There is a new paper on radiosonde homogenization by Dai et al., if you haven’t seen it already. Thanks for highlighting this, I am just taking a good look at it now. So much for the 1948-1973 part of M2010. It also looks like he would get different results if he used ERA-40 for 1973-2008. As far as determining trend, the full uncertainty in the water vapor content probably doesn’t fully propagate either, widening the confidence limits on the trend. I didn’t check for serial autocorrelation either, which would also make the confidence limits wider if present. Hoo-bloody-ray. This is why I like this site. Will you compare this in the same way to the amount/depth of CO2? mkelly: If one cooled the atmosphere until it all liquified, the atmosphere would condense to make a layer roughly 10 m thick (assuming a density of about 1 g/cc for liquid air, a reasonable approximation.) The calculation is a relatively simple starting with atmospheric pressure at sea level (ca 100,000 N/m2 or 14.5 psi). The CO2 layer would currently be about 0.04% of 10 m or 4 mm. In condensed form, CO2 and water near the poles are both about the thickness a pane of glass. When liquids evaporate, they typically increase their volume 1000X at 1 atm. In the case of the atmosphere, expansion is all in the vertical direction. This would make the atmosphere roughly 10 km thick – if it weren’t for the fact that the pressure has dropped in half by about 5 km. So half the atmosphere lies below about 5 km, 75% below 10 km, 87% below 15 km, etc. Thinking about the atmosphere as a 10 m thick layer of liquid that has evaporated and further expanded near the top makes the atmosphere seem more tangible to me. 1. Just as with the discussion over Miscolski, it is not the tau, but the GHE that is significant. By using precipitable water as a metric, one is looking at tau, not the GHE. Precipitable water could conceivably rise while the greenhouse effect of water vapor simultaneously fell. How could this happen? It is the temperature at which water vapor emits to space that is important. As noted, water vapor decreases significantly with height away from the surface. If the increase is near the surface but a decrease or even steady level of humidity occurs above, the GHE wrt water vapor might decrease or remain little changed. 2. An understandable problem with humidity trends from sonde data is the reduction in response times through the history of humidity sensors. But were this the sole cause of the trend, one would expect that effect to diminish over time as sensors have become more up to date. But one sees a continuing decline in humidities through the last decade. atmosphere.” From the above paper. Water vapor not increasing as predicted. And the IR absorption coefficient of carbon dioxide is about 30 times larger than for water vapor. Quantity alone is insufficient to draw a conclusion on the size of the effect. I don’t disagree with what you say (I thought it was 25) but it does bring up probability. What is the probability of any one photon chancing upon a CO2 vs H2O. Did you bother to read the article before you posted? The data graphed is obviously the NCAR/NCEP reanalysis data which is highly questionable prior to 1973 and controversial after 1973. * SSMI has a trend of +0.37 mm/decade. * ERA-40 has a trend of +0.70mm/decade over the oceans. * NCEP has a trend of -0.1mm/decade over the oceans. Just a point to show that some data can be let say at odds and choice of data and datums then becomes an issue. Great post SOD. And thanks for the references. I haven’t read any of the references yet. May take a while for me, but looking forward to it. Looking forward to the continuation. Perhaps you think I am trying to make the case that there isn’t much water vapor? If that is the thinking behind the request – no, it is just a handy way of summarizing the total water vapor by geography, given that water vapor is not well-mixed in the atmosphere. If it’s because you think that might demonstrate something important about the relative radiative effects of these gases in the atmosphere, it doesn’t. The equations of radiative transfer are very non-linear, and the absorption coefficients of water vapor and CO2 are not equal. Still, many people who have no understanding of the equations of radiative transfer, or the spectroscopic values measured for these two gases, do frequently point out the relative concentrations of CO2 and water vapor. There is a lot lot more water vapor than CO2 in the atmosphere. So much more in fact that if radiative effect was linearly proportional to concentration then water vapor would be >95% of the “greenhouse” effect. People who point out the relative concentration with an air of QED have demonstrated their flawed understanding of this subject. Unless they go to overturn many decades of research. But in that case, there would be a little more substance to the argument and the relative concentrations would be brought up at the end where the NEW equations were applied to demonstrate the tiny effect of CO2.. The request is that in all the reading on your blog, which by the way I enjoy tremendously, I never found that you put forth the amount of CO2 in that way. If both are GHG’s then to be fair in the representation I thought a similar representation ought to be layed out. That is all. In Water Vapor Trends – Part Two I have also commented on the blog article as well as explained what I think is the issue with Paltridge et al 2009. Sure there are vast numbers of radiosonde soundings, but the vast majority are land based. ERA-40 for land is in relatively good agreement with land based radiosondes. That means that it is likely that the discrepancy in humidity trends over the ocean between NCEP and ERA-40 represents a systematic bias in NCEP data. Given the noise in the mass of the dry atmosphere before 1973, I don’t have confidence in any trend calculated from pre-1980 data. What is the probability of any one photon chancing upon a CO2 vs H2O. What’s the wavelength of the photon? The IR photon mean free path at the surface varies from cm to km depending on the wavelength. It’s not the probability of the encounter that’s important, it’s the probability of interaction, which is also wavelength dependent. Agreed. I have never seen a probability chart showing H2O vs CO2 for all the wavelengths of both absorbing spectrums. i would think it varies land vs ocean vs latitude. A general comment re. ‘water vapor positive feedback’. I in no way wish to denigrate the amazing work being done to analyze the detailed physics of the chaotic atmosphere but still assert that: Regardless of the spatial and temporal variations of water vapor’s effect in the atmosphere, (the 10u IR window aside) water vapor is the only mechanism by which the other 75 % of earth cooling is implemented. As such it is the only mechanism for cooling response to any warming (positive forcing) which will generate additional water vaporization. Cooling response to warming is the definition of negative feedback. Are we to believe that increased water vapor response to any positive forcing even with a local positive water vapor feedback loop at the surface can have any other net effect on climate than negative feedback? In control systems terms; the net ‘authority’ of water vapor cooling is ~120 watts/m^2. Authority of other atmospheric physical processes and elements, 0. If there is a ‘greenhouse’ effect from CO2 in the upper troposphere is not the issue here. Merely that any forced warming from any source will result in increased water vaporization which being the only cooling mechanism the planet has will increase cooling until the warming is balanced. This does not preclude delays in responses but is demanded by steady state average energy balance. The only cooling mechanism the planet has is radiation. Vacuum doesn’t conduct heat by any other means. If you mean the surface instead of the planet, you’re still wrong. Latent heat transfer from the surface to the atmosphere amounts to about 85W/m². This can be calculated to a first approximation by the total annual rainfall and the heat of evaporation of water. Meanwhile, the surface radiates approximately 400W/m² to the atmosphere and directly to space. If you look at net transfer, latent heat transfer is about half the total of ~166W/m². Sensible heat transfer is another 15W/m² and the rest is radiation. I explain about “cooling to space” in The Atmosphere Cools to Space by CO2 and Water Vapor, so More GHGs, More Cooling!. Basically, most of the radiation to space from the climate system is emitted from the atmosphere. More GHGs means more radiation to space from the atmosphere than the surface – that is, more surface radiation is absorbed by the atmosphere. And then re-emitted to space. However, the atmosphere is colder than the surface so the radiation to space is reduced. Less radiation to space = heating the climate system. 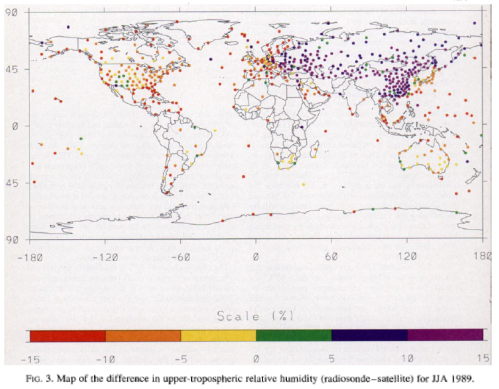 Regions with high humidity emit less radiation to space than regions with low humidity. That is for regions at the same temperature. More water vapor = less radiation to space. on July 1, 2016 at 6:38 am | Reply Water Vapor Trends | The Science of Doom | SMIPP Ltd.